Charlestown Navy Yard was my next stop in Boston! This particular navy yard opened in the year 1800 where it served as an area to build naval warships and then supply and repair them when necessary. More than 200 warships were build here, not even counting the thousands that were merely repaired, before the navy yard was closed in 1974. Now it is part of the Boston National Historical Park, and two naval vessels - the USS Constitution and the USS Cassin Young - still reside here as reminders to prospective visitors of Boston's naval past. The first thing I noticed upon stepping off the tour bus was this HUGE anchor mounted on the grounds! I immediately raced over to climb it. Can you find me? I then spent a few minutes on the boardwalk, taking in the view of the naval yard and the waterway. Although still quite early, I nearly had the place to myself - it was already rather hot! I wasn't complaining; I'm too used to Southern humidity! I ventured into a park (very fittingly called "Shipyard Park") set up around the outskirts of the naval yard and happened upon the Korean War Veterans Memorial. 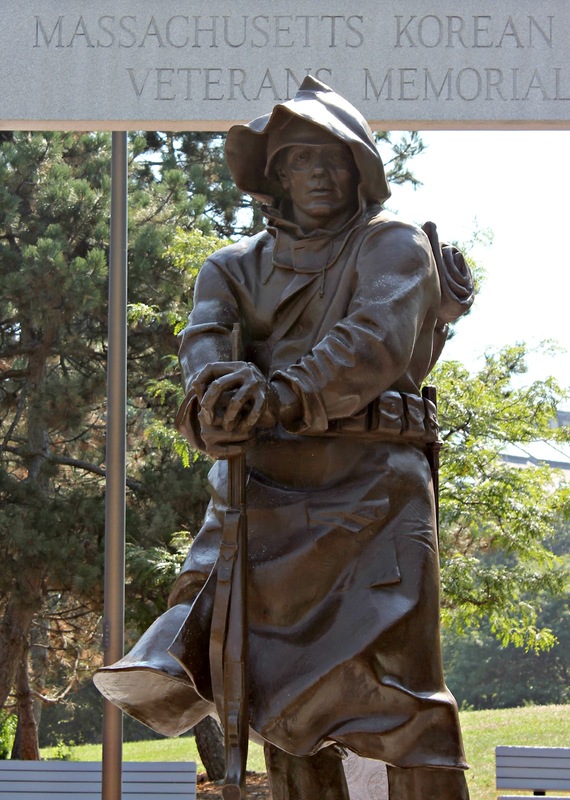 This memorial was dedicated on July 28, 1993. I felt very patriotic (and a tad bit silly, not being American!) standing next to this United States flag at the memorial. I walked around Shipyard Park a little bit more. I passed a playground with no children on it. I was thinking how odd a park was without any children playing in it, until I happened upon this fountain! Apparently Boston allows the city children to wade in designated fountains on hot days! How cool is that?! The tour guide told us later that there used to be a city ordinance against that, but enough people complained to repeal the rule! I'm glad - fountains should be for wading! I very much wanted to join the children in the fountain, as I was already hot and sweaty. Not having brought my swimsuit, I sadly moved on. I had other places to see around the navy yard and a limited amount of time in which to see them. Here is how downtown Boston looked from the navy yard. I love looking at city skylines. There is just something about them that makes them pleasing to look at! Have you ever played in a fountain on a hot day? What do you like to do to cool off? oh Sophie!!!!! Boston looks amazing!!! I wish I lived near there. OR that i could visit there, but sadly, home school is starting. but can you tell your sister i say hi? im a big fan of your blog. Sophie .. I Miss you soooooo much .. looks like you had the time of your life .. so much history .. you know how I love history .. I want us to come up and see those places .. how exciting ..
School starting again and so we will be home now doing that stuff. We did get to order Caroline's table and chairs, her birthday food set, her birthday dress, her hat and coat and then skates. All for the free shipping in NY. We are very excited to see it all. Mama might get the skiff for us this spring since it is wood, and would be really neat out by the island. Life has been boring here, Taryn keeps going into the counseling sessions with Mama and I stay home, I did the last time Mama went so this one Taryn has been going. I've never been there. It's too long a walk from the Boston side of the Freedom Trail. That fountain looks like just the thing on a hot day. 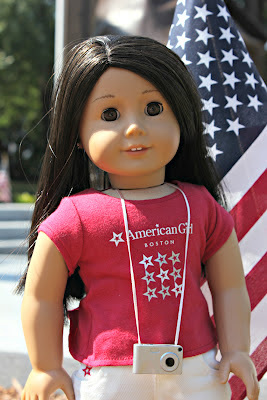 Day 3: American Girl Natick! Day 2: Greater Boston Metropolitan Area! Day 1: Keene, NH with Susie & Claudia!